For lovers of sea turtles and the many people who have dedicated hours, days, months and years of their lives to the protection of turtle nesting grounds, tracking and monitoring turtle activity and sharing those stories with all of us, last week holds a major success story. Why? Because red turtle friendly lights have been installed in the lamp posts all along the road by Darkwood Beach after 10 years of lobbying by activist Mykl Clovis-Fuller of the Antigua Sea Turtle Project (ASTP). 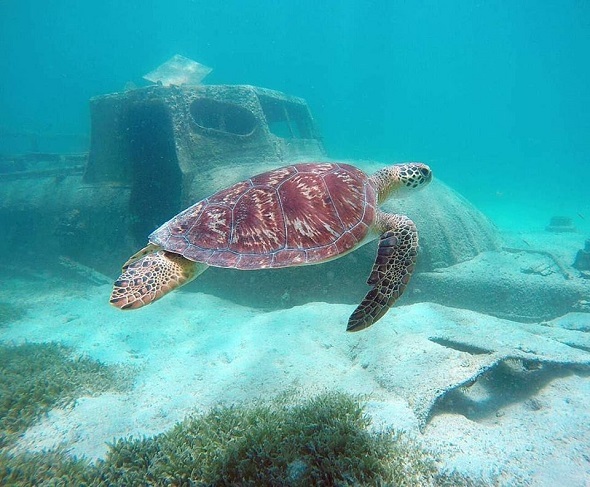 The Antigua Public Utility Authority (APUA) has replaced the former white lights with red tinted LEDs, which will minimize disturbance to endangered sea turtles. The new red diode LEDs emit a long wavelength light that is much less attractive to sea turtles than shorter wavelength white / blue lights. Senior Fisheries Officer and WIDECAST Country Co-Coordinator Tricia Lovell noted that “this is a big win for marine turtle conservation in Antigua and Barbuda and I am very pleased that APUA has finally taken on the recommendations.” These measures further support the Fisheries Act of Antigua and Barbuda, which protects nesting sea turtles from harvest, harassment, and disturbance. In 2007 the first ongoing survey of mainland nesting beaches was conducted by the Antigua Sea Turtle Project with invaluable guidance from WIDECAST and the Jumby Bay Hawksbill Project team. This survey which continues to this day includes collecting data at turtle nesting beaches, tagging every nesting female turtle so that they can monitor their movements and identify them when they return to Antigua sometimes many years later. The ratio of survival of a hatchling to a fully mature adult is 1 in 1000 so they need all the help they can get to be able to reproduce. All turtles found in the Caribbean are listed as endangered species including Green, Hawksbill and Leatherback and the visiting Loggerhead Turtles. The decline in their population has been directly attributed to human intervention: pollution from land; the usage in some nations of turtles for food and or jewellery; and, anchoring on foraging seagrasss and reef areas.. The sargassum seaweed that has washed up on the shores of the islands of the Caribbean has imperilled turtle nests as beach erosion has literally washed away nests. The National Parks Authority is also doing its part in communicating about the issues that can be detrimental to sea turtles. Event organisers too need to be aware of the perils of setting up events on beaches where turtles nest. This same issue became a major problem in Barbados last weekend when event organisers flagrantly ignored the rules and drove on a beach to set up stages, platforms and fences which potentially crushed eggs due to the weight on the sand and speared eggs with stakes as the nests are not far below the surface. The beach was one which typically can have more than 100 turtle nests during the months from June to November. The Barbados Sea Turtle Project Group communicated its concerns and the event was subsequently cancelled and all set up successfully removed by hand, thus minimising further damage. It’s sad to see that rules were ignored in this way, but great to see the response from the sponsors of the event, Yello, who made the decision to cancel the event once they were alerted to the issues. The EAG host a small number of people each week through the summer months to visit Jumby Bay on Friday evenings to be part of the Turtle watching team. Get in touch with them to find out more.